Tell me a little about your background and approach. Shaina Yeh architecture in Delhi and then an MFA at UCLA. I did film in Bombay and then film and media art in Temple University, in Philadelphia. But I think for both of us it’s more like a very organic approach to contemporary art practice- coming from limitations or a critique of our own early mediums or formats of working. So a lot of the video- or documentary-based work that we do as CAMP and even that I do on my own, looks very carefully at the methods and the processes of documentary film. So from the very basic issues of the author, his or her gaze, the technology…the kind of technology of the camera. From say about 2004-05 every project tries to unveil these things in some form, early on there were experiments with a lot more participatory, cheaper, easier to access technologies but soon I started looking harder at the omnipresence of the medium and even started using surveillance technologies. gma Did you supply the camera used in The Neighbour Before The House then? Shaina, Yeh, I bought it in London, on Edgeware Road, and took it there. I’m sure we could have bought it in Tel Aviv but I was mostly going to be in Palestine and not really move, so…. gma Ah! I’d assumed it was a pre-existing camera, in situ, in the house perhaps -which seems like a ridiculous error now! Shaina Ah no not at all! It’s an over-the-counter camera, a normal or consumer-level surveillance camera; a dome camera, the one’s you mount that look like light fixings -you see them all over the place. But they’re pretty potent, they’re called PTZ cameras; 360 pan, 180 degree tilt and seemingly infinite zoom; 220X! I did an earlier project in 2008 in Manchester where we managed to access CCTV control rooms -of the Uni, of the police, of the Arndale mall, which is apparently the largest mall in the UK and in turn we opened them up to members of the public, through listings, and through open-calls, sign-ups. All sorts of people signed up, to come in to the CCTV control room and spend an hour there. They could do what they want; snoop around, question, gaze, whatever. gma And so how did you approach making use of the Palestinian voices in relation to the images generated? It’s no longer a lens-based practice, you know the director or the cameraman’s privileged frame, right? Its framing, it’s all about the four corners, what the image contains, rather than about what the image exudes. To always contain things, and not have them project outwards. And I think the approach in Al Jaar is different and links to some of my earlier works as well, but -essentially to do away with the lens as well (not just the auteur) or turn that, or offer these possibilities and privileges -of this look and gaze and all- to the subjects themselves. And really deal away with… some projects there’s no editor. As in this case, right, when they’re experiencing it. So we housed the camera in a wooden box because of course we can’t house it on the ceiling, it’s just going to be itinerant on rooftops. We worked with eight Palestinian families and it came together quite organically because we ended up mapping out East Jerusalem, from the nucleus in the old city right next to the Western Wall, to Shaikh Jarrah and the more affluent neighbourhoods of East Jerusalem where there’s a lot of Settler activity. You know a hundred houses; (in Silwan and Shaikh Jarrah) Palestinian families who were given houses in the 50s by the UN and stuff, they’re all being evicted, completely evicted. So it’s Old City, East Jerusalem, and then the larger picture – the Wall comes in and cuts, eats up a lot of East Jerusalem and there by the wall you lose your Jerusalem ID and you find yourself in the West Bank and so on. So that’s the kind of field that these eight families ended up forming. gma So how does this notion of the neighbour work for you, in this context? gma So how did it work in practice? I mean I’m intrigued by the actual process of ‘filming’? Shaina In terms of process, each family mounts the camera, in a position of advantage, either their roof, terrace, their balcony. 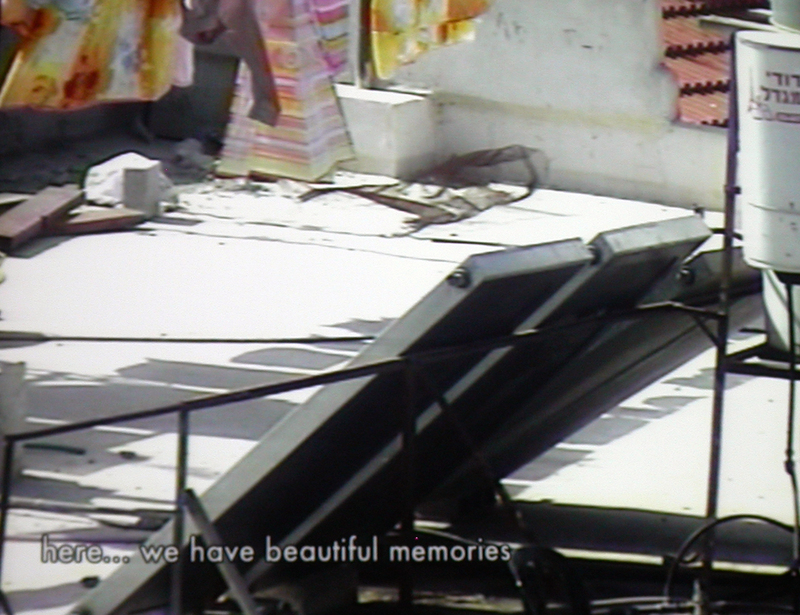 In the cases where some families have been evicted, like 60 days ago and who come and protest outside their house, then the camera was mounted on a neighbour’s roof, a safe distance from their (occupied) house. But in a way that they could see and go into their own homes. So the dome camera was mounted on the rooftops, then the wire was sent straight to often their TV sets, so they’re getting a live feed, just like you get in a CCTV control room, and then the controller for these things, like I said, as I found out in Manchester, is just a keyboard and a joy-stick. They’re called PTZ, so it’s pan, tilt and zoom. Shaina The mum says that. That family has a rawness and urgency to look back in their home and to spy on these Settlers, because they were evicted 61 days ago! gma So was that in Shaikh Jarrah? Shaina Yes, that was in Shaikh Jarrah. You see the film has this quality of long takes, because they’re sort of units, they’re kind of live commentary, and now we’ve cut it, we’ve edited it for the film but it still has this footageness to it; because you’re not cutting images and you’re not montaging things with a voice over, it’s married in that sense to the commentary, it’s a unit with the image. Some perform, some narrate, some have conversations. It’s a different quality through the material. It was quite intense while we were there and at the same time we went through a parallel process of getting it all translated and we wanted to put something up for the show there and not just leave it as a process work. So we did these -were you in Liverpool? Shaina So we did these quick cuts, those were done right there in Jerusalem in October. And we were still working with more families, and the new material we didn’t even look. We cut five episodes, (based on 5 locations) just so that there was some feedback; families could come to the venue and see some things. We always wanted to return to the material and try to make it this film on Jerusalem and that we did now. That took us a year. Shaina The archive is not like YouTube, so someone has to be pretty serious. We don’t get random users really. Sometimes we get random up-loaders and we’re really excited and then it’s like a fake plane crash or something. I won’t say it’s curated, or like we control or censor what’s going in, but still it’s a community of users were always in conversation with, like we were just talking to [a curator who] wants to put [an Art Institution’s] talks or archive and things in. So it’s still a small enough group of colleagues, often its connected to our networks, the independent documentary scene in India, film studies…or a lot of art documentation is going in now. Shaina Yeh yeh that’s true. gma Yeh but just over the hill there’s a huge Settlement built on stolen Bil’in land which is going to be the fourth biggest city on the plains; Modlin Ilit. And yet from within the remaining village territory you can’t actually see it over the hill [you have to ascend into the Palestinian hills to see over] and I think that this is kind of what it’s all about, how it works. gma So that’s what I like about the film because, especially around the Moroccan quarter and al Aqsa, it recovers the placedness of the place which has become abstracted -and abused- as space, which is a primary method of the Occupation… Your work here uses spatial technologies to recover place which very much interests me. One of the things is also that of course there are still so many things that you still cannot see, which it points to. They’re talking about things, even around al Aqsa for example, like the tunnels and stuff, like the machine; there’s apparently a kind of exhibition display in one of the Israeli built tunnels, which has a model of the Al Aqsa collapsing and the Temple Mount rising. All of these things are things you cannot see so it’s also about the limit of an optical thing that is stuck to, it’s not a satellite image, but is actually stuck to a human eye view which is not telling a 3-D story of what lies underneath, tunneling and all that, but it kind of points to that; it’s there and people are talking about it. Or you just remember that that construction site, you’re like ‘hey I can show you’, because you’re talking about neighbourhood activity, a new construction site, whatever; suddenly the person realises that hey you can just go out, go left and find it! It’s a bit of a strange reminder, when in the very first episode [al Aqsa/Moroccan quarter] it happens quite poignantly, when Haifa is looking at a scene that she can normally look at from outside the window, but now that she’s in her room and she’s looking at soldiers that are gathering outside, she’s afraid for herself, like ‘am I spying on them?’ -even though it’s literally outside the window of the house that she’s been living in for a century, you know? So it’s a strange thing that points out this kind of contradiction between what you’re able to see as a person and what you’re able to see with the camera.